Note: This issue follows the conclusion of the Black Vortex event. Nova flies to Long Island, NY, to visit the parents of Rich Rider. At first, Charles Rider believes it is his son flying home. He is overwhelmed when he realizes it is a different Nova and he is holding Rich's helmet. Sam tells him that he's sorry. Sam spends the entire night talking to the Riders. He tells them about Rich's death and the Riders tell him about their other son Robert who is still out in space. As he prepares to leave, Gloria Rider asks Sam if any Novas survived. The teenager says that there's hope some did and mentions his father is still out in space. Charles and Gloria instruct Sam to find his father and bring him home. Later at Carefree High School, Principal Philbin tells Sam Alexander that he is proud of the young student because he was able to study hard lately and pass to the next grade. The principal suggests that Sam get a job during the summer break. As he skateboards away, Sam mentions that he has a job but thinks to himself that it's a job that probably won't keep him out of trouble. Back at home, the Alexanders are having dinner with Sam's girlfriend Carrie. She is going to help Eva take care of Sam's sister Kaelynn while Sam is searching for his father. After Carrie leaves, Sam puts on the Nova helmet and says goodbye to his mother. She tells him that she packed food and a clothes in his bag. As Sam flies into the vacuum of space causes the air in his sandwich bags to explode. Some time later on Knowhere, Sam meets up with Cosmo. The Earth hero lets his canine friend eat his sandwiches and asks him for a favor. The teenager considers putting out a distress message about Jesse Alexander but needs help figuring out the best way to do it. Cosmo suggests a different method since not everyone likes the Black Novas. The telepathic dog believes a better idea would be putting out a bounty on Jesse of a few million credits. Sam wonders how he'll get that kind of money. Later on Chitauri Prime, a masked Nova enters the Chitauri Reserve Bank and breaks into its vault. As he leaves with a bag full of gold, Nova yells to the Chitauri that they have been robbed by Deadpool! Back on Knowhere, Sam announces his bounty on Jesse Alexander. He repeats the announcement on Oblitus and later in an alien bar. In every bulletin, Sam makes it clear that the escaped prisoners are to be brought in alive. He also gives out a frequency that his helmet can receive for any information the bounty hunters are able to obtain. Meanwhile in deep space, Jesse Alexander and his crew are negotiating a deal to trade food, fuel and transportation for the technical specs of their Chitauri warship. However, before they can finish the deal, a holographic image of Nova appears and it announces the ten million credit bounty. Now that everyone knows about the escaped prisoners and their ship, Jesse decides they have to move their plans up and leave immediately. As they prepare to leave, the alien they were negotiating with slips away and hides a tracking device under a console top. As the word on the bounty spreads throughout the galaxy, it reaches a number of Sam's fellow heroes. Beta Ray Bill, Rocket Raccoon and Captain Marvel all receive the message. Captain Marvel also gets a message from Steve Rogers who asks her to help Nova in his quest. 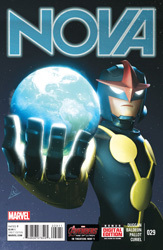 Later, Nova finds himself under attack by a starship whose captain decides to try and steal the bounty. Sam Alexander fights back and blasts his way through the ship! The angry hero grabs the captain and tosses him aside when he receives a message in his helmet. The message is from the spaceship Ghost Nebula. The ship's captain informs Nova that he has placed a tracer on the ship he's looking for and wants to claim the bounty in exchange for the device's location. To prove his claim, the alien plays a recordeding of Jesse's earlier conversation. A short time later, the two meet in a secluded part of space. Sam Alexander agrees to pay the captain half of the bounty now and the other half when he locates his father. The alien captain agrees and gives Nova the tracking device's locator. Elsewhere, the Chitauri decide to end the empire's humiliation caused by Nova's bounty. They awaken Warbringer to kill the Earth hero! Later on Warbringer's Dreadnought warship, the intergalactic hunter begins punishing the Chitauri who allowed Jesse and his crew to steal the warship and Nova to steal from their treasury. When Warbringer asks what action he should take, one of the tortured Chitauri suggests they destroy Earth to get Nova's attention. The captain of the Dreadnought considers the idea and agrees it's better than his thought to simply kill the Chitauri captives. As they prepare to head to Earth, the ship receives a transmission from the Ghost Nebula. A hologram of the Ghost Nebula's captain appears and asks what it's worth to know the location of the stolen Chitauri warship!